I have posted pictures of every pattern that I am aware of and have seen. This does not mean there aren't others out there traveling about the United States, Canada and Mexico. There are 3 that I know of, that I have not seen as of yet. "Renaissance" and "Platinum Filigree" are out there somewhere, as is the "Delicious" pattern that was printed on French White. 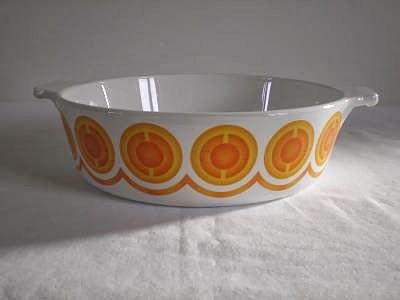 There are also the round Buffet servers in White, Butterscotch, and Avocado as well as Laurel, Summerhill, and Lynnwood which matched Centura dinnerware patterns, but most of these are clearly marked as "Buffet Servers" on the bottom. With the Centura matching pieces, only the lid had a design on it while the body of the piece was solid colored in either Green, Butterscotch, Yellow or White. But, there are some patterns that I HAVE seen and have no idea what the pattern name is. May these were test patterns that never made it to market, but managed to make their way into the thrift store. Mysterious Wheat pattern that I just began collecting. I have no idea what it's name is, nor do I know how many different pieces were made. Then there is this one.... 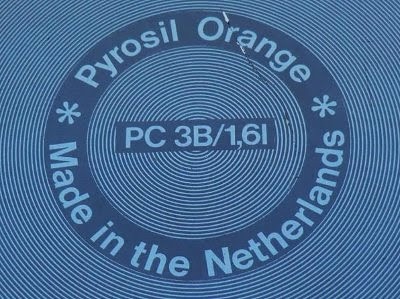 Though it is from the Corning Factory in the Netherlands (Pyroflam), produced for the UK market in the 70s. I only have 2 pieces of this... a 2 1/2 quart and a 6 cup teapot. 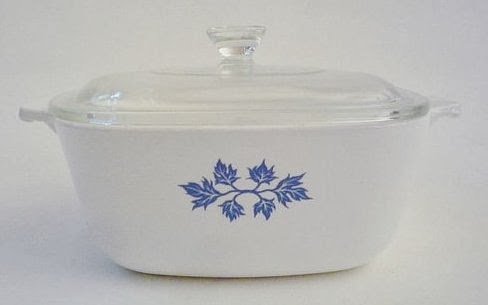 I have no idea what the name is, but through several searches and piecing bits of information together, it appears that this Blue Leaf design was a promo for "Blue Band" butter. Simply save the vouchers and you could turn them in for this "Vitroceramic" Pyroflam (that is what Corningware is known as in Europe) Cookware. 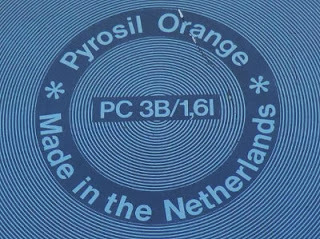 marked as Pyrosil Orange or Electro depending on where is was marketed. 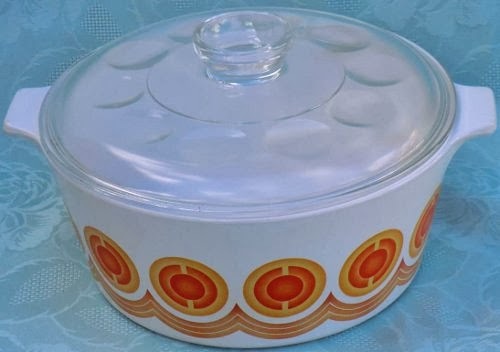 These pieces had lids just like the Merry Mushroom that was marketed in the United States. My mom was upset to have recently broken her vintage Corning P-3-B 1 quart, yellow (harvest?) casserole. 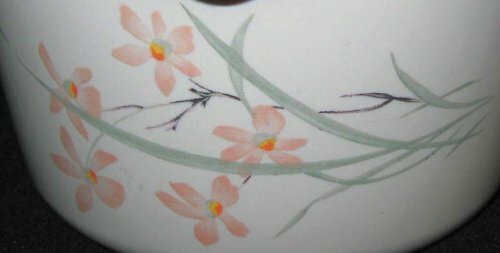 I have been searching for a replacement as she so liked the specific shape and size of this piece. All I have been able to find online are several P-1-B casseroles. Can you tell me the difference between these two model numbers? Thanks again. Oh Ouch!!!!!! I can understand. If you are talking about the yellow square shape, then yes.... That is "harvest". The yellow round shaped buffet servers were callled "butterscotch". The model numbers tell you the handle shape, the size in quarts and whether it's a cover or bottom. A P-1-B is a bottom casserole with the original handle that holds 1 quart. A P-3-B should be a 3 quart casserole bottom. A suffix of "C" instead of "B" indicates a cover. The prefix of "A" instead of "P" would mean the piece is post 1972 when they made the handles wider. The detachable is designed different for the "A" models. Mine looks like that on the bottom but is a different design. 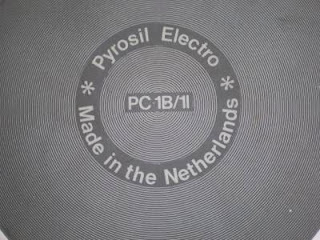 I don't know what the spiral grey on the bottom is made of, so can it go in the microwave, do you know? Thanks. As far as I know, these pieces were only enameled on the bottom, so it should be microwave safe. That's good to know - thank you, Shane.